We would like to extend our thanks and appreciation to Frieda Miller Brown for her diligence in coordinating our dinner at Pad Thai on Tuesday evening. Although the weather presented some challenges, we were happy to have several sistahs and guests joining us. The Temple Beth Sisterhood extends a warm welcome to our newest members, Judy Finkel and Barbara Rosenthal–both of whom traveled from Akron’s West Side to share the evening with us. 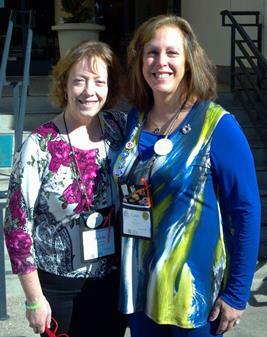 Robin Rosen-Sharp and Lisa Singer were all smiles for this photo taken last week in San Diego. Along with Sandy Adland, the three sistahs represented Temple Beth Shalom at the North American Women of Reform Judaism (WRJ) Assembly. Congratulations to Lisa on her installation as an officer on the North American WRJ Board of Directors. We wish you continued success! Highlights of this event have been posted on YouTube. Kathy Snyder is excited to report that plans are underway for MITZVAH DAY 2014. This event, which enables participants to donate their time in giving back to the community, will be held on Sunday, June 1, 2014. Organizational meetings are currently being held and volunteers are being recruited. Kathy may be contacted at katsny0401@yahoo.com.